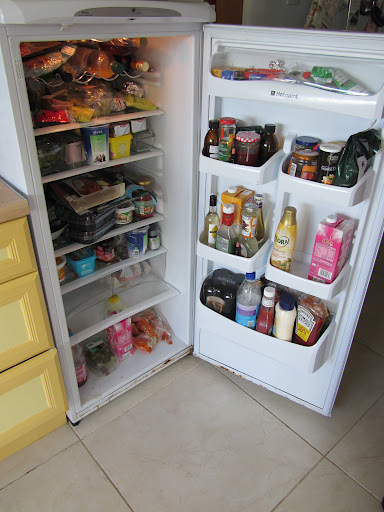 In the interest of inspiring others (and in shaming myself into action) I am letting you see the awful state of my fridge. Look at it. It’s awful. 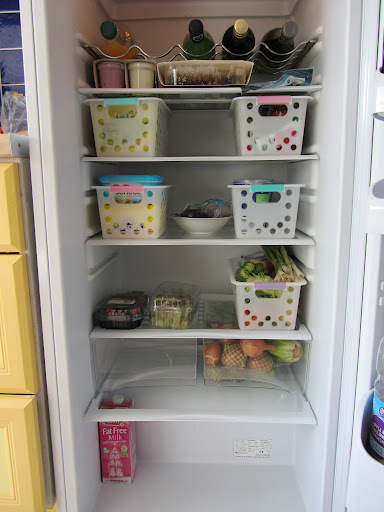 There’s so much food crammed in there and none of it is organised. In my defense, it’s been a crazy few weeks and I’m not the only person who lives here. Most of that food is not mine. 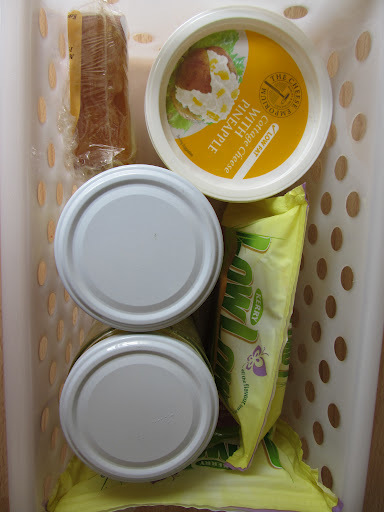 Recently on Pinterest I saw a picture of someone’s freezer, which had plastic baskets keeping it tidy. I had to try this! 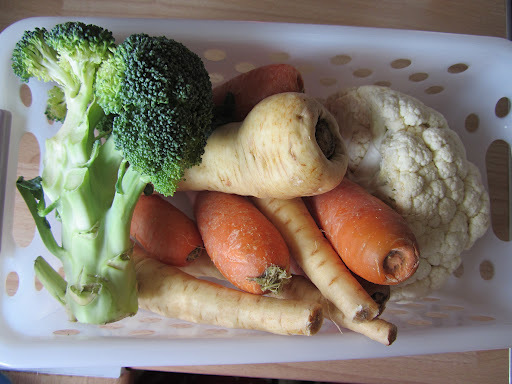 In a pound shop I found exactly the right sort of baskets for just €1.50 each! Is this not a most beautiful sight? 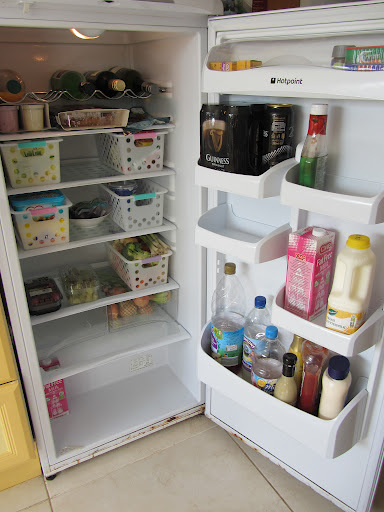 Empty the fridge and throw out ANYTHING that needs to go, or that won’t get used. Any dairy products that are past their use-by date need to go. Condiment bottles that are nearly empty – let them go. Clean, scour, scrub! 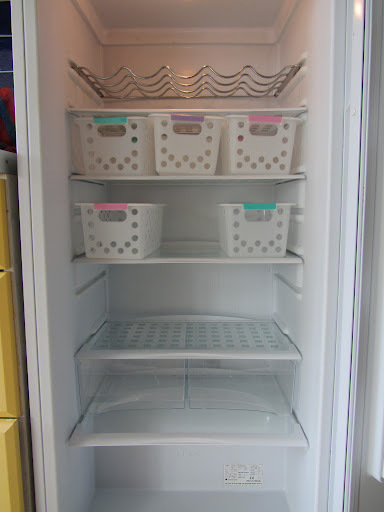 Take out the shelves, clean and dry them, wash the sides down and make sure it’s all ready for the food. My generation depresses me. This world of buying cheap things, using them until they die and discarding them is getting me down. Clothes, home decor, jewelry, you name it, we consume it and then promptly throw it away. I miss the world I grew up in, the world of having certain dinner plates and silverware that were only used on Sundays, and tea cups that were only used if my mother was feeling extremely extravagant and free-spirited. It gave things a sense of occasion. It made it special. Nowadays, of course, we use mugs that can be washed in the dishwasher and cleaned with minimum fuss. Well I happen to enjoy a bit of fuss. Especially if it means taking a little longer to enjoy a dinner when it’s being served from a terrine that matches your plate. 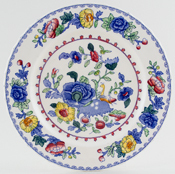 Or a slice of cake from a little plate that matches your cup and saucer. It’s ceremony! It’s elegance and festivity! It’s not downing a bucket-sized cup of tea for the sake of caffeine (although that will forever have its place in everyday life). It’s taking some time with a friend or family member to catch up and relax. This evening after dinner I decided to have a rummage around and tidy out the sideboard in my parents house. Of course I was never allowed near it when I was a child because it housed all manner of beautiful, delicate things. My mother was in love with a blue Aynsley china set of cups, saucers, dinner plates, bowls, jugs, gravy boats… everything except a teapot, actually. During my rummage I uncovered all the extra pieces that had been concealed. Now the complete matching set sits in pride of place on top of the side board. I also made several exciting discoveries! A set of hand-painted EXTREMELY delicate china cups, saucers and cake plates that belonged to my grandmother, a Waterford Crystal duck (!! 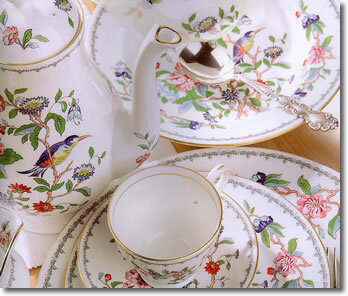 ), another two complete matching tea and dinner sets. (Denby and another one I’ll have to look up) and several candlestick holders. Not to mention a plethora of linen napkins, both plain and embroidered. I’ve convinced my dad that next time we have people over for dinner we must use one of these sets. Including dessert and coffee, of course. And all served on one of the newly uncovered tablecloths using some nicely pressed linen napkins. It’s all sort of prompting me to be a bit more careful and thoughtful about what I have and what I buy. Maybe if we all had a bit of a rummage, or just looked with fresh eyes on the things we already have, we could learn to appreciate them a bit more and not feel the need to buy new, convenient wotsits every time we walk into a shop.